What is nitrous oxide and why is it used in dentistry? How will my child feel while they are breathing nitrous oxide? What are the more common side effects with nitrous oxide? Does nitrous oxide work for every child? What Medications will be used during my child’s oral conscious sedation appointment? Any special instructions before the oral conscious sedation appointment? What is general anesthesia and when is it used on children needing dental work? How does dental treatment under general anesthesia work? Some children may feel anxious or fearful prior to the start of dental treatment, and may need more help than just the support of gentle, caring staff members. At Baker Pediatric Dental Care, we have several options to help your child have the best experience possible. Each of these options will be discussed below. Nitrous oxide (also known as, laughing gas or nitrous) is a safe and effective sedative agent that helps to calm children down by relieving their anxiety, and can also increase their pain threshold making certain parts of the dental experience (e.g., dental injection) more comfortable. Nitrous oxide can also improve communication between the dentist and child, and help to relieve a gag reflex (if present). Nitrous oxide is delivered through a fitted mask that is placed over the child’s nose. The child then breathes the gases – oxygen and nitrous oxide – through their nose, which then quickly takes effect. Towards the end of the procedure, the dentist will have your child breath oxygen for a few minutes to help eliminate any residual nitrous oxide from your child’s body. Your child will feel like they are floating on a cloud and feel very relaxed while inhaling nitrous oxide. Nitrous oxide can cause a feeling of euphoria, which, in higher doses, can cause patients to laugh (hence the name). Children can also feel a tingly sensation in their arms and legs, and feel like they are dreaming. These are normal sensations that will cease after the nitrous oxide is no longer being breathed in. Nitrous oxide is very safe and is used by pediatric dentists on a daily basis. It has a rapid onset, can be reversed, can be titrated (dosage can be adjusted), and is well tolerated by children. In addition, your child is fully awake and can respond to commands or questions as well. Occasionally, nitrous oxide may cause nausea and vomiting, however, this is rare and typically seen when much higher doses are used. It is usually recommended that little to no food is consumed two hours prior to your child’s appointment to minimize the likelihood of nausea or vomiting. The short answer is no. Every child is different, and has different dental needs. Children who are very young, extremely anxious, or have nasal congestion may not be good candidates for nitrous oxide sedation (by itself). These children may need to complete their dental treatment via oral conscious sedation or general anesthesia pending on their dental needs. Oral conscious sedation is a technique that involves giving children specific types of medication(s) to reduce anxiety and/or fear and increase cooperation when performing dental treatment. These sedation medications help make children relaxed and drowsy, and, unlike general anesthesia, are not meant to make a child completely unconscious or unresponsive. Is my child a candidate for oral conscious sedation? Sedation is not a perfect solution for every child, so case selection is key. Children that are overweight or obese, have enlarged tonsils, are heavy snorers or who have underlying health issues (e.g., heart problems) are not good candidates due to safety issues that may potentially arise. Also, children who have a shy temperament are more likely to respond to the medications in an undesirable way, which decreases the chances of successfully completing the dental treatment in this way. Thus, case selection is key to increase the chances of success and to minimize the risk potential. Oral conscious sedation can be performed in a safe and effective manner, however, case selection is key. In addition, the pediatric dentist who is administering the medications must follow the sedation guidelines set forth by the American Academy of Pediatric Dentistry to help minimize risk. A variety of different medications are available and can be used when performing oral conscious sedation. 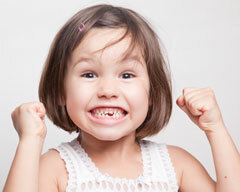 Ultimately, it is up to the pediatric dentist to determine which medication(s) should be used. Typically, medications are chosen based on the amount of dental treatment that needs to be performed and the child’s level of anxiety. Your child will be instructed not to eat or drink anything starting the night before their appointment (this is very important). If your child becomes ill before their appointment, contact your pediatric dentist to determine if their appointment needs to be rescheduled. Be sure to tell your pediatric dentist about any medications (herbal, over-the-counter or prescribed) your child is currently taking to determine if your child should stop taking the medication(s) prior to their appointment. If your child has any underlying health issues, be sure to mention these to your child’s pediatric dentist so that he/she may determine if a medical consultation is necessary with your child’s pediatrician. Sometimes dental treatment needs to be completed using general anesthesia on the following types of children: Very young children, children who are fearful and/or anxious, children with extensive dental needs, children who are unable or unwilling to cooperate, and on children with special needs. Without the help of an anesthesiologist, these children may not be able to have their dental work completed in a safe and effective manner. An anesthesiologist is a medically trained individual who puts people to sleep using specific medications, and then monitors them while they are under the effects of those medications. While the child is asleep and being monitored by the anesthesiologist, the dentist completes all necessary dental treatment. General anesthesia can be used in a safe and effective manner when done so by a well-trained anesthesiologist. The anesthesiologist will closely monitor your child throughout the procedure to help ensure that your child is safe. Once your child is released into your care, they will be tired and sleepy for the rest of the day given that the general anesthesia medications are still in their system. Your child should rest at home with very little activity for the remainder of the day. The anesthesiologist and dentist will review all necessary dietary restrictions and post-operative recommendations to help ensure your child’s safety and full recovery.